82 Kata Road. Tambon Karon ,Muang, Phuket Set in a landscaped garden in a beautiful valley, Kata Country House offers Wood Bungalows, Standard, Superior and Deluxe rooms decorated with rustic country style. At the Kata Country House, you can indulge yourself in total relaxation. 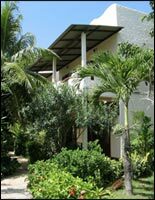 We offer 14 Bungalows,3 Family Room, 20 Deluxe, 22 Superior and 13 Standard Rooms all hidden away in the natural landscape of a tropical garden. 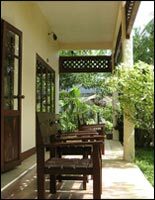 The Wood Bungalow is 40 square meters, Deluxe Rooms are 28 square meters, Superior Rooms 24 square meters and Standard Rooms 21 square meters. Restaurant has a capacity of 60 persons. Our Restaurant features Thai and International specialties for daily breakfast. - Terrece is open during lunch and dinner featuring a seafood BBQ. The Lobby Lounge offers refreshing drinks.